For 2016 Scorpion delivers two graphic trips in the time machine, in the form of the VX-35 Dirt Helmet and the EXO-T1200. Both of these are solid performers, so we are very excited to see some fresh designs come out of Scorpion for the new year. 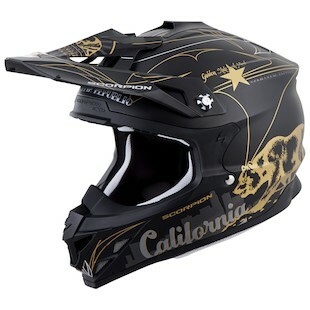 If you’ve been thinking that what your Dirt attire is missing is a touch of Von Dutch, then the Scorpion VX-35 Golden State Helmet is the answer to your prayers. Featuring classic Pinstriping, this helmet has a touch of that vintage So-Cal Hot Rod and Chopper style made famous by the now legendary Kenny Howard who painted under the pseudonym Von Dutch. If the Southern California reference was not apparent enough, Scorpion added a couple Bears (as featured on the California state flag), an outline of California and the words California and Hollywood, with a several palm trees for good measure. This is all done in white and gold over satin black adding a much needed infusion of Luxury aesthetic to the world of Dirt riding. 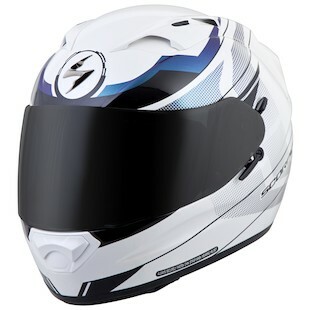 For those whose aesthetic inclinations are more based in Miami during the late ‘80s, there is the Scorpion EXO-T1200 Mainstay Helmet. This new graphic features design which harks back to the early days of MTV, Miami Vice and 1st wave computer generated design. If you’ve been searching for a lid to match your 1987 Suzuki Katana, consider your search over. Either way, whether you are pounding trails outside of Palm Springs or cruising through Coral Gables, Scorpion is delivering specific options to match your favorite era.